Architect Byoung Soo Cho’s Earth House is quite possibly one of the classiest dugouts ever built. 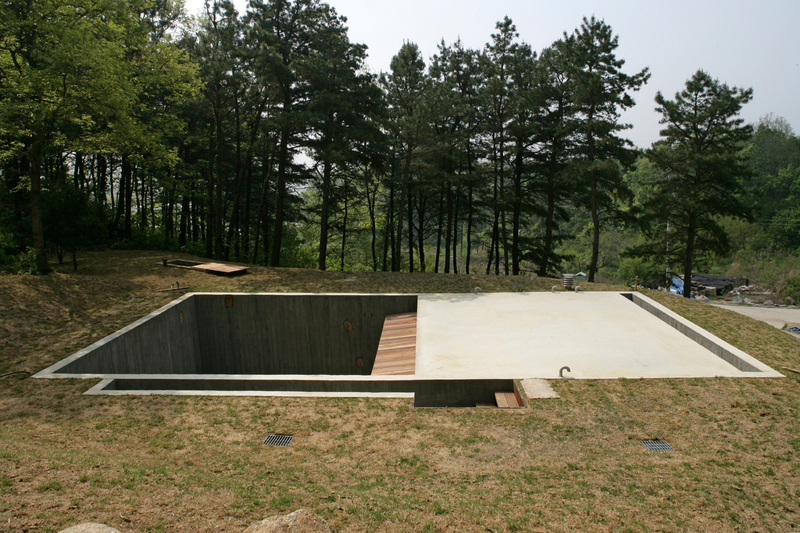 Set amid peaceful woods and rice fields an hour east of Seoul, Korea, the subterranean structure consists of six tiny unadorned rooms (kitchen, library, two bedrooms, and a bathroom) and a 23-by-23-foot courtyard. Cho describes the house, dedicated to Korean poet Dong-joo Yoon, as a place for self-reflection. He says the concept goes back to his 1991 graduate thesis at Harvard, where he began exploring Taoist ideas about negative and positive space, and the question of just how much (or little) space we need in order to live comfortably. Sixteen years and several unsuccessful attempts at selling an underground house later, Cho finally decided to build one for himself. Earth House was completed in February 2009 on a lot down the road from Cho’s more conventional vacation home, the square-shaped Concrete Box House. He currently uses the Earth House for weekend gatherings and stargazing. A square hole in the ground and a concrete slab are all that demarcate Byoung Cho’s Earth House from the surrounding countryside. Visitors enter through a narrow staircase, visible here as a slit to the right of the courtyard. At night the courtyard and light well (foreground) become dramatic blocks of light, illuminating surrounding trees. The floor of the courtyard is made of rammed earth from the building site, as are the walls and floors of the interior. All doors, including this one leading to the stairway, are about four feet high. Slices of a pine tree cut down during construction were embedded in the courtyard’s concrete walls as a symbol of rebirth; Cho envisions grass sprouting from the rotted wood in a few years. The courtyard is slightly raised in the center to enable water to drain to the four corners. The juxtaposition of raw wood, stone, and concrete brings out the beauty of each material. Earth House is dedicated to Dong-joo Yoon, a Korean poet who died as a political prisoner in Japan during WWII. Friends gather under the shelter of the recycled-wood canopy for a reading of Yoon’s work. The bathtub is a simple box made of fragrant hinoki cypress. Its shape echoes one of Cho’s favorite inspirations: a wooden apple crate. Light from the courtyard silhouettes a paper-covered door. The handcrafted doors and windows lend elegance to the earth rooms, which are surprisingly cozy thanks to radiant heating. The house has two doors, one leading to the library and kitchen, and the other to the bedrooms and bathroom. The two sections are not connected by any interior passage or door.